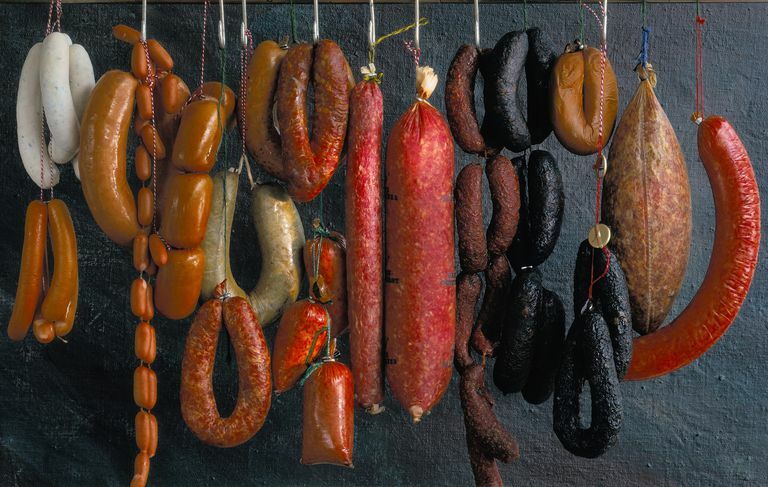 Sausage comes in many different varieties. Because many different types of meat and animal parts can be used in the production of sausage, it's hard to say if sausage is healthy. But in general, sausage is high in fat and calories. So if you're trying to slim down or maintain your healthy weight, it might be hard to include this food in your regular meal plan. Many nutritionists include sausage in their list of common empty calorie foods. Empty calorie foods provide energy primarily in the form of added sugar and unhealthy solid fats such as saturated fat or trans fat. Many empty calorie foods also provide high levels of sodium. Nutrition data varies for different kinds of sausage. Italian sausage calories and nutrition (shown) indicate that even though the food provides protein, it is high in calories, high in fat and very high in sodium. The USDA provides nutrition data for other types of sausage. The most popular type of sausage is the hot dog. A beef hot dog provides 186 calories, 7 grams of protein, 2 grams of carbohydrate, 0 grams of fiber, 1 gram of sugar, 17 grams of fat, 6 grams of saturated fat and 572 milligrams of sodium. But when you eat a hot dog, you probably also eat a bun and a maybe even a few toppings. A hot dog bun provides an additional 100 calories, 4 grams of protein, 18 grams of carbohydrate, 1 grams of fiber, 2 grams of sugar, 2 grams of added sugar, 1 gram of fat, and 180 milligrams of sodium. If you add mustard and ketchup your calorie count will probably not increase much, but you may add a few grams of sodium and sugar. Because of the fat and sodium content of sausage, it is not the healthiest choice at mealtime. If you're trying to improve your eating habits for improved health, there are other meats and non-meat protein sources that provide better nutrition. There are, however, some types of sausage that are slightly more healthy. Some butchers and popular brands make chicken, turkey and even seafood sausage that are slightly lower in fat and calories but still full of flavor. One link of Aidells Chicken and Apple sausage provides 180 calories, 12 grams of fat, 3.5 grams of saturated fat, 12 grams of protein and 640 milligrams of sodium. One serving of Aidells breakfast sausage (made from chicken and apple) provides 120 calories, 8 grams of fat, 2 grams of saturated fat, 8 grams of protein and 420 milligrams of sodium. One link (78 grams) of al fresco brand Buffalo Style Chicken Sausage provides 100 calories, 5 grams of fat, 1.5 grams of saturated fat, 13 grams of protein and 510 milligrams of sodium. Two links of breakfast sausage made from turkey provide 70 calories, 3.5 grams of fat, 1 gram of saturated fat, 2 grams of carbohydrate, 8 grams of protein and 340 milligrams of sodium. In general, processed meats like sausage are not considered "healthy" foods. But no single food is going to make or break a healthy eating program. If you like sausage, keep it in your diet, but eat it in moderation and try to fill up on lower fat, nutritious foods including vegetables, fresh fruit, whole grains, and lean protein. What is a single serving of sausage? In general a single serving of any meat or seafood is 3-4 ounces. However, you'll notice that on many processed sausage packages, a single serving is indicated as one link—which is usually less than three ounces. For example, a single serving of Applegate Farms Hot Dogs is one hot dog, or 47 grams (1.65 ounces). A single serving of Johnsonville Original Recipe Breakfast Sausage is three cooked links, or 55 grams (just under two ounces). Are hot dogs cooked or raw? According to the U.S. Food and Drug Administration, it is a myth that hot dogs are pre-cooked. The agency recommends that you cook hot dogs completely before eating. How long does sausage stay fresh in the refrigerator? Most manufacturers recommend that you consume sausage products before the "best by" date on the package. Once a package is opened, you should consume the food within three days. You can freeze sausage. Put the meat in an airtight container. Individually wrap each sausage if you plan to eat small portions occasionally. Thaw in the refrigerator. Can I make my own sausage? Yes! Making sausage is easy and fun. Use this Healthy Low-Calorie, Low-Fat Turkey, Bacon and Apple Sausage recipe to give it a try. Remember that a single food—like sausage—won't make or break your diet. Try to plan healthy meals and enjoy an occasional indulgence in moderation for good health and well-being. University of Michigan. What are empty calories? MHealthy Nutrition and Weight Management Program. U.S. Food and Drug Administration, Center for Food Safety and Applied Nutrition. Food safety for moms to be: hHighlights - fact or fiction. Web.